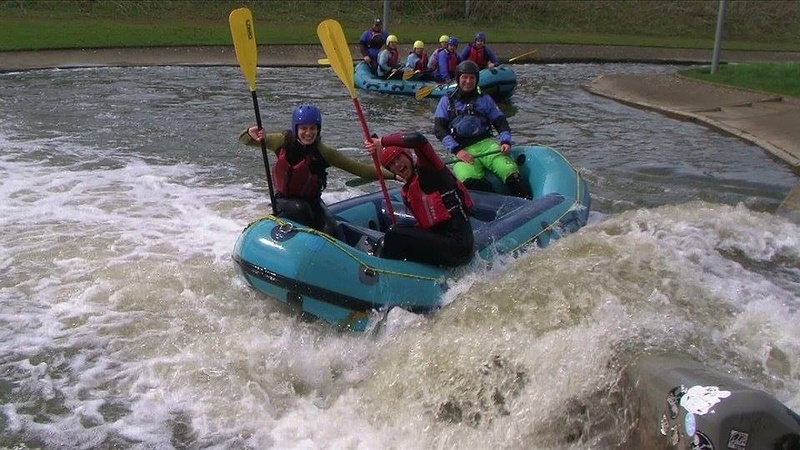 In teams of 6 its up to you to manage your way successfully down the raging rapids! This man made course is perfect for testing the abilities and getting some practice in a safe environment. Tackle the wild rapids with this man made white water rafting experience and feel the adrenaline pump as you race down the course in a 6 or 8 man raft. Learn the basic skills of rafting with a qualified instructor on board and prepare yourself to battle your way through the raging water. Hold on tight and experience the thrills of this fun and unique day out.Your experience starts with a briefing about safety and white water rafting techniques for the pair of you, then it's on with your safety gear and you're off, as your qualified guide takes you and your fellow rafters down a varied white water run in an inflatable six or eight man raft. You may get more than one run dependent on conditions and time. Each boat is guided by an expert instructor. Available from April - October. The 2018 start date is Saturday 7th April. Parental consent needed for under 18's. Please Note: For group bookings child participants must be mixed with adults due to the physical abilities needed to lift the raft at various stages throughout the course. All Participants must be confident in open water and be able to swim 25m with flotation device. White Water Rafting is not suitable if you are pregnant. Participants will not be permitted under the influence of drugs or alcohol. You should allow up to 3 hours at the centre for your experience. Participants: The White Water Rafting Experience for 2 - Man Made Course is for 2 participants. All specialist equipment such as wetsuit, buoyancy aid and helmet will be provided by the centre. You should take your swim suit & towel, a spare pair of trainers and warm clothing to change into afterwards. Rafting operates in most conditions but may be affected by extreme weather conditions. Please check with the centre on the day or the day before your experience.